When Lincoln Fowler, co-owner of Alterra Coffee Roasters, decided to open the company’s ninth and newest location in Riverwest, he planned to follow many of the same environmental steps as his other cafés. Restoring the buildings and blighted brownfield at 2941-3009 North Humboldt Blvd. was in the plan, while rebuilding was not. “We like having the bones of years previous inform the design we execute,” said Fowler. 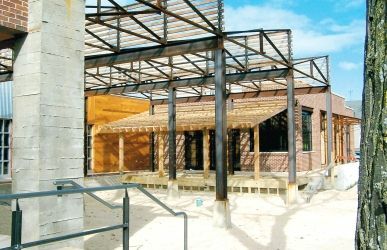 “Many of our café projects draw from the history of the structure [such as the] cafes at Prospect, the lakefront, and the foundry.” However, because of “structural issues,” the buildings on Humboldt had to be demolished, but 90% of the old buildings, in the form of concrete and steel, were recycled into the new construction. Over three million dollars, several architectural drawings and a few demolitions later, the Alterra in Riverwest: The Ecology of Coffee opening moved from August to a tentative December. Fowler seemed undeterred, saying: “Great things tend to come with a bit of pain.” Government agencies helped relieve a bit of the monetary pain, as they donated to the cleanup of the three “taxdelinquent brownfields,” according to an April 2007 Department of Natural Resources press release. Alterra received a total of $674,000 from the DNR, the Department of Commerce, the City of Milwaukee and the US Environmental Protection Agency to clean up the three sites on Humboldt, out of 250 identified brownfields in Milwaukee. Formerly, the three brownfields were a gas station, a dry cleaner and a masonry and steel frame building. If the structure had been renovated and not rebuilt, Fowler believes that it would have earned a LEED (Leadership in Energy and Environmental Design) certified status, possibly at the silver level. Because of the lost time and money in deciding not to renovate, Fowler said they didn’t want to pay the extra $60,000 – $80,000 to get the new building certified. Nevertheless, he believes, “the new building would score equally or better than the old version.” Natural light pours in through windows and skylights of the new building, well-insulated walls reduce energy use, bicycle racks cater to commuters, and local materials support the urban economy – all aspects that LEED takes into consideration. Fowler is a member of the City Redevelopment Authority board, but wasn’t involved in the sale of the land in that function. Lincoln Fowler coowns Alterra with his brother, Ward Fowler, and Paul Miller. The new structure is truly a “complex,” as many are referring to it. Not only will it house the new Alterra café, but Alterra is also moving its bakery to the location in late October. Fowler anticipates this will allow the Riverwest café to carry some exclusive bakery items that wouldn’t travel well to other locations. A new coffee roaster installation will follow the bakery. Next, the wholesale distribution and administration offices move. The café opening is the last step. Two retail spaces were also built into the complex. Loop Yarn Shop closed their Bay View location in mid-October for their move into the complex. One empty retail space remains, and discussions are in the works about a credit union as the additional tenant. Before beginning renovations, the building at 3009 N. Humboldt suffered from some aesthetic vandalism. After the owners allowed one of their baristas, Scott Lucey, to stencil rosettes inspired by latte-froth on the building, an unsolicited, intricate stencil of the Dalai Lama appeared. While the lowering of the site by two feet to almost ground level makes for “better [handicap] access and better retail presentation,” according to Fowler, the large glass panes and streetlevel access could perhaps invite crime. No vandalism has occurred since the rebuild started. Alderman Mike D’Amato has said the project is “a major shot in the arm” for the Riverwest neighborhood. It may also be a shot of adrenaline for other businesses, hopes Fowler. “Locust is a great street and we hope the businesses that are there will find benefits to our new project,” he said. “Perhaps some of our neighboring businesses will find reason to make additional investments in their facilities.” He also hopes that the café will unite all different types of people from Milwaukee: “The artist, the student, the tradesperson, the professional commuting down Humboldt or the professional living in the neighborhood.” The new Alterra would create 18 to 23 new jobs in the first two to three years, and maintain its partnerships with La Escuela Fratney and the Holton Street Youth Center. “We’re pleased to be part of positive change in the neighborhood,” he said. Conversely, the new location may be a “gunshot in the arm” to the existing coffee culture of Riverwest. The landscape is already changing, with Fuel café changing to a non-smoking establishment as of Oct. 1. As soon as the change happened, Fuel barista Korin Schneider saw some of the old customers leave, and new customers arrive. Conflicted between serving Alterra coffee and maintaining customers, Schneider believes part of the reason Fuel went non-smoking had to do with Alterra moving in the neighborhood. “We’re a small business, which Alterra isn’t anymore,” she said. The owners of Fuel and the owners of Alterra worked together in a tannery 15 years ago, and are still amicable, but have taken different approaches to the atmosphere that surrounds their beloved beverage. “We’re sure not as expensive,” Fuel barista Clifford Smith added. “And we beat them in the Shepherd Express ‘Best of ’ poll.” Despite Schneider’s belief that customers usually hold loyalty to one place, she saw the morning clientele switch to Art Bar. In addition to allowing smoking in some areas of the bar, Art Bar also serves Alterra coffee, Bloody Marys and a variety of warm, alcohol-laden beverages. Bremen Café also allows smoking, but doesn’t open early enough to catch the morning rush. “It’s going to be an interesting winter,” Schneider said.